The audience was blown away when this group of young talented musicians, Carl, Alan, Reginald and Gerald with the veteran pianist, Alvie Givhan made a debut performance as a quintet for the packed audience at Levitt Shell's #5 Fridays of Jazz @ Memphis Central Library in March, 2016. Click the image in the left to view their performance. Jazz is what we like to do! When Carl & Alan Maguiire, born in Tokyo, raised in Hong Kong met Reginald White at world renown Stax Music Academy when they were high school students. Since then, they have been playing together. Along the way, they found Gerald at University of Tennessee in Knoxville, TN and they have decided to form a quintet with Memphis' veteran pianist, Alvie Givhan who is known for his tasteful touch. Their first performance of Levitt Shell's #5 Weeks of Jazz Series received a standing ovation from the packed audience. They want to continue to do what they like and deliver their passion of jazz with their music in the world. The older International Jazz Twins, Carl & Alan were born in Tokyo, raised in Hong Kong. When they moved to Memphis at age 15, they found passion in jazz at Stax Music Academy. Discovered by Donald Brown during his college recruit trip, they recorded their first CD ‘The Sound of Music’ with two of Memphis jazz icons, Kirk Whalum and Donald Brown in 2014. They are currently studying at UT Knoxville under Brown. They have toured Japan and Hong Kong in 2013, 2014 & 2015 and getting ready for another adventure there to spread their message of jazz this summer. 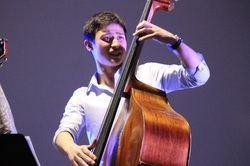 The younger International Jazz Twins, Carl & Alan were born in Tokyo, raised in Hong Kong. When they moved to Memphis at age 15, they found passion in jazz at Stax Music Academy. Discovered by Donald Brown during his college recruit trip, they recorded their first CD ‘The Sound of Music’ with two of Memphis jazz icons, Kirk Whalum and Donald Brown in 2014. They are currently studying at UT Knoxville under Brown. They have toured Japan and Hong Kong in 2013, 2014 & 2015 and getting ready for another adventure there to spread their message of jazz this summer. 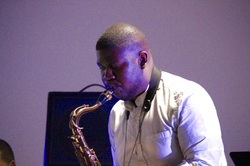 An emerging young saxophonist from Memphis. He started to play sax at age 10 and learned music at Stax Music Academy when he was a high school senior. Currently studying at Morehouse College in Atlanta on full scholarship. Reginald hopes to keep playing as a side occupation and to develop an initiative for music and math education for elementary school students. 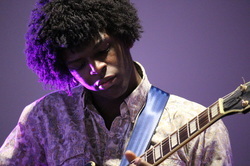 Gerald tarted to play guitar seriously at age 16. 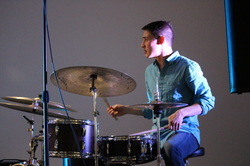 This hard-working musician taught himself to make it to All West Jazz Band in TN while in high school and he is currently studying jazz at UT Knoxville. His grandfather who is a band director has been his inspiration. Gerald’s goals are to make music that people want to hear and bring the things that he loves about Jazz along for the ride. Born into a musical family in Somerville, TN and started to play the piano at age 3. 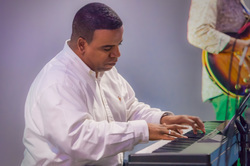 Alvie earned a masters in jazz piano pedagogy at University of Memphis. He was an adjunct faculty member and performed with the U of M faculty ensemble. He is a well known local pianist and played with Marvin Stamm, Bill Easly, Slide Hampton, Joe Lavano, Kathy Kosins, Louis Bonilla, etc. He was a featured artist at the New Daisy Theatre by U92 during their 2013 Radiothon.